Secrets of the microfarm: Amoeba grows bacteria! Synopsis: Down on the Microfarm, Amoeba Grows Bacteria! 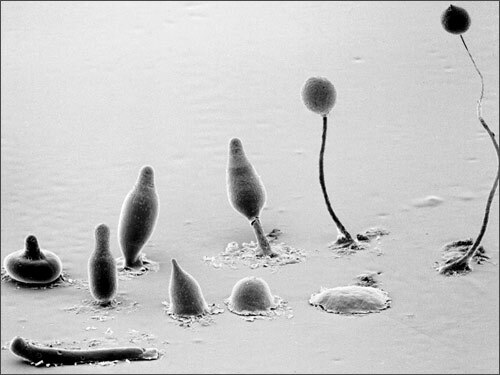 One species of amoeba can transport and plant bacteria when it runs short of its normal food, bacteria in the soil. A recent study is the first proof that anything smaller than an ant can “farm,” and shows how evolution can produce alternative strategies to meet the challenges of survival. The single-celled amoeba Dictyostelium discoideum has no brain, but its complicated social cycle enables farming. What is the working definition of “farmer” in the article, and how do these amoeba satisfy this definition? What are some of the social and economic benefits of human agriculture, and how are they rooted in farming? How did the advent of farming change human history? How did the study author determine that it’s “normal” for these amoeba to carry bacteria? Why does the article say that evolution would favor a species that comes up with alternative survival strategies? Be an amoeba detective. Ask students to collect soil samples and, using a compound microscope, have them record the protozoa they can see on this worksheet, or something similar. Have students compare the protozoan’s shape, movement, cyst formation and feeding patterns. (Students can use this resource to help them with the identifications.) Have students discuss the relationship these organisms might have with their ecosystem. Recommended for grades 8-10. Amoebas and me. Have students research the relationship between amoebas and people. Ask them to develop a skit that presents this relationship. Who else is down on the farm? Ask students to research other organisms that farm and write a paper, or conduct a more creative activity, that describes their farming techniques.